Error! 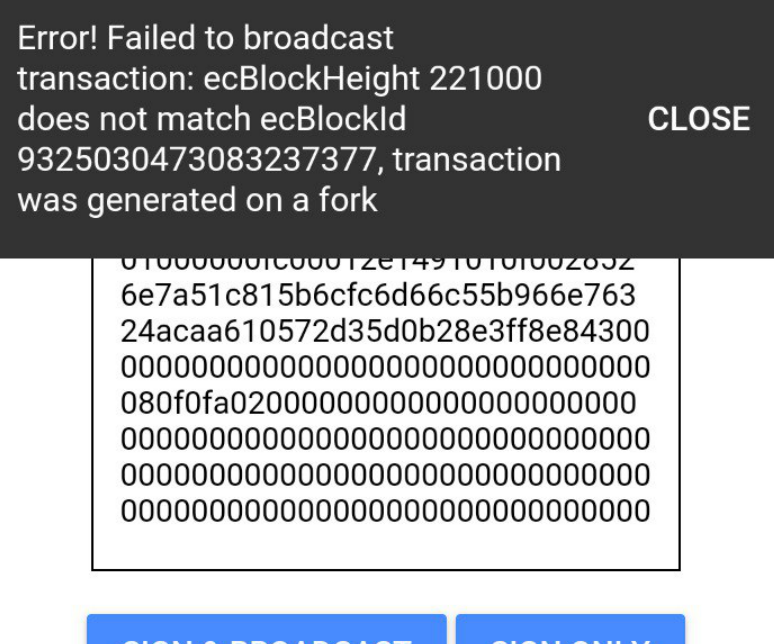 Failed to broadcast transaction: ecBlockHeight 221000 does not match ecBlockId 932...., transaction was generated on a fork. If i sign the transaction and broadcast it manually via the ardor desktop gui wallet via "broadcast", it works. I'm just not sure how this error is occurring or what does it mean? I got this same exact error when I tried to sign a mainnet transaction using a testnet API, so, make sure you are using the same network.. This is what we call a replay protection error, the ecBlockId and ecBlockHeight params must point to an existing block already in the blockchain. You can also omit these fields and let your node assign them. Not the answer you're looking for? Browse other questions tagged blockchain-fork ardor ignis or ask your own question.